Today, I'm writing about the top five tearjerker endings in old Hollywood films. Barbara Stanwyck in Stella Dallas (1937) is on the list. This article is part of The "No, You're Crying" Blogathon: Our Favorite Tearjerker Films hosted by Moon in Gemini. Old Hollywood films were great at making audiences laugh, but they were unparalleled at making viewers cry. During the 35-year reign of the old Hollywood studio system, viewers grabbed for their hankies in everything from ancient Biblical epics (who doesn't get a little verklempt at the end of Quo Vadis or Ben-Hur) to tough-as-nails gangster sagas (more on that below). With that in mind, I'm writing about the top five tearjerker endings in old Hollywood films. I included clips of each scene plus the ways you can watch the entire movie. As always, there's a lot of great movies I've left out so feel free to add your own favorites in the comments section. Note: I am writing about the endings of these movies, so spoilers abound. Mother's Day in the U.S. is tomorrow (May 14), so it seems appropriate to start with the 1937 version of the often-filmed melodrama Stella Dallas. The film stars Academy-Award nominee Barbara Stanwyck as a gauche woman who gives up her place in her daughter's life so she can advance in society. In the powerful final scene, Stella, now impoverished, watches her daughter's nuptials through an open window. The cumulative effect of the rainy cinematography, evocative score, and Stanwyck's great acting make this one of old Hollywood's most memorable final scenes. DVD and video on demand. Old Hollywood studios regularly trotted out animals in their quest to open up audience's tear ducts, but, while most of these films involve death in one form or another (see any Disney film and/or The Yearling), Lassie Come Home actually has a happy, albeit weepy, finale. The beautiful final scene combines great animal acting from Pal, aka Lassie, with the talents of MGM's second-weepiest child star Roddy McDowall (first-prize goes to grand-champion crier Margaret O'Brien) for a grand finale that still leaves audiences with tears of joy. TCM at 9:45 a.m. June 19; DVD; video on demand. Thwarted romance was always worth a good cry. Famously weepie finales include Humphrey Bogart and Ingrid Bergman's parting in Casablanca (1943) and Bette Davis and Paul Henreid's bittersweet reunion in Now, Voyager (1942), but nothing can compare with the final scene in the 1939 adaptation of Emily Bronte's 19th-century novel, Wuthering Heights. Director William Wyler's version of the death of Cathy Earnshaw (Merle Oberon) is the ne plus ultra of cinematic romanticism, especially when Heathcliff (Laurence Olivier) proclaims "I cannot live without my life. I cannot die without my soul." Streaming on FilmStruck; DVD; video on demand. James Cagney probably had more memorable death scenes than any other old Hollywood actor (see The Public Enemy, The Roaring Twenties, White Heat), but there's still nothing quite like the electric chair sequence in the gangster saga, Angels with Dirty Faces. You need to watch the entire film to get the full impact of the story of two childhood friends who grow up to very different fates, but even without the whole story, Cagney's howling, shrieking demise is gut-wrenching, and the movie's final line, delivered to perfection by the always underrated Pat O'Brien, can still make grown men cry. DVD. 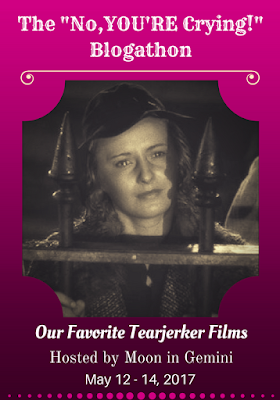 No tearjerker list would be complete without Bergman, old Hollywood's queen of photogenic weeping. In the biopic The Inn of the Sixth Happiness, she plays real-life missionary to China Gladys Aylward, who, during World War II, overcomes the Communist army, bandits, and bad weather to lead 100 orphaned children to safety. The powerful final scene in which Gladys and the children stumble out of the mountains to the cheers of the assembled townspeople will give you a new appreciation of the nursery rhyme, "This Old Man." Streaming on Netflix Instant; DVD; video on demand. You're right about Ingrid Bergman being the "queen of photogenic weeping". She truly is! Your excellent post made me realize I've never seen Angels with Dirty Faces. I don't know what the heck I'm waiting for! Enjoy! It's a great movie. Oh, Inn of the Sixth Happiness! What a wonderful selection for your list. Lassie Come Home gets me every time. One of MGMs very best. Cagney! You reminded me of Life With Father. It's a wonderful comedy, but there is a lovely scene with Irene Dunne and William Powell singing in the twilight, and it always gets to me. The songs in John Ford films, especially Rio Grande, always make me tear up a little too. In a career of great performances, I think this is Stanwyck's best moment. These are great picks! Can't argue with any of them, especially Angels with Dirty Faces.